Repeat a lie often enough, according to Joseph Goebbels, and it becomes a truth. Ironically, during these times, this rings true very often, especially because there has been a deluge of misinformation that has been circulated by RH backers. 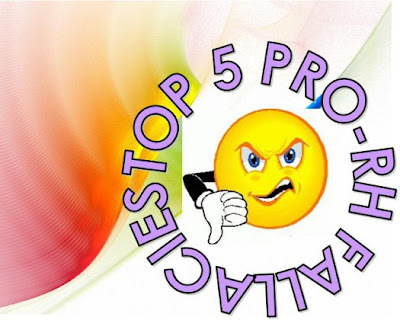 Here are the top 5 most outrageous fallacies that have made the rounds in forums and in debates. 1. False: The country needs to slow down its population growth rate/lower fertility rate/lessen the number of people because too many people cause poverty. Truth: The country’s growth rate have been going down since the 60s and according to the NSO, our growth rate is at a measly 1.94%. This is without the benefit of an rh bill. On the other hand, according to the country’s premier economist, Dr. Bernardo Villegas, 200 billion pesos are lost annually due to tax evasion, and another 200 billion lost due to graft and corruption. Given these numbers, should we lessen the number of people, or curb corruption? Truth: The Malthusian way of thinking – that too many people in a country causes poverty – has been long debunked by people like Simon Kuznets, who was a Nobel Prize winner for Economics. There has never been a clear connection between economic growth and population growth. However, in an article from the Asean Economic Bulletin entitled “The Relationship Between Population and Economic Growth in Asian Economies,” written by Wong Hock Tsen and Fumitaka Furuoka, “For China, Singapore, and the Philippines, population is found to Granger cause (or directly cause) economic growth and not vice versa. “ Similarly, reports coming from HSBC says: ““The Philippines looks set for a multi-decade run of strong growth,” and BSP Governor Amando Tetangco mentions that “the Philippine economy will get additional boost from its citizens by 2015 as it enters the demographic “sweet spot” or average age of Filipinos 22.2 years.” He cited a recent United Nations study which showed that the Philippines is the last major economy in Asia that will benefit from a period wherein bulk of the population is of working age and has the capacity to spend. 2. False: Contraceptives are safe. The IARC and the WHO have declared that combined oral contraceptives are group 1 carcinogens – meaning that they are known to cause cancer to humans, and that they, along with other materials like cigarettes and asbestos, are the most cancer-causing. Most pro-RH proponents are quick to either deny or downplay this fact. One common excuse is that even Paracetamol is cancerous (but are not taken off the shelves of pharmacies). That is just a very ignorant way of downplaying the risk. The fact remains: combined oral contraceptives cause cancer, like breast cancer. Besides, you do not take Paracetamol 21 days straight like you do with OCPs. 3. False: There are 11 mothers dying daily because the RH bill hasn’t passed yet. 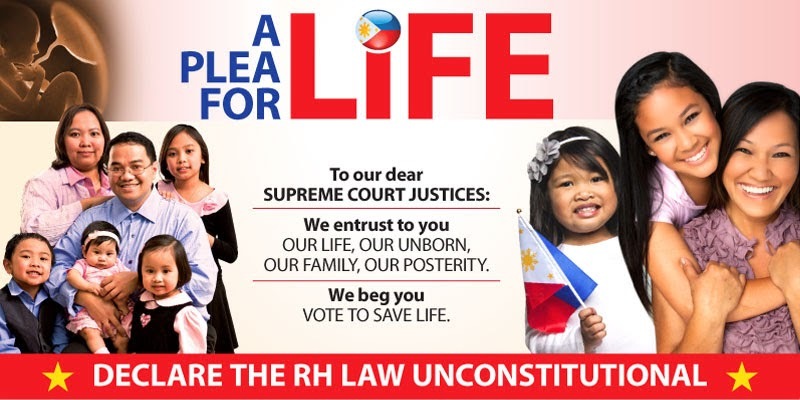 “The issue at hand is the pro-RH lobby’s emotional and exclusive use of “11 maternal deaths a day” to scare lawmakers into spending billions of pesos in taxpayers’ money for its contraception and sterilization agenda. The pro-RH statistic is clearly outdated as attested by not one, not two, but three sets of data. If RHAN-Likhaan-DSWP cared to look elsewhere, they would have found that we had also cited the September 2010 report of the World Health Organization (WHO), Unicef, the United Nations Population Fund (UNFPA), and the World Bank, which estimated annual maternal deaths in the Philippines at 2,100 in 2008. That is equivalent to 5.75 deaths a day, a completely different level than “11 a day.” This was clearly down from the 2000 level of 4,100, or 11.2 a day, which was published in a report seven years ago by the same international agencies. We are astounded that the pro-RH lobby had to go to great lengths to justify the excessive and exclusive use of “11 a day.” We wonder why the figure is now attributed to government statistical agencies, when before, credit was given to the UNFPA and other international bodies. Did the lobbyists misrepresent old data as current? There is a word for that: disingenuous. That is the plain, ugly truth: the RH camp lied, and continues to lie, about their own data. If they can be dishonest with this and appeal to emotions by using bloated numbers, I believe they are capable of more dishonesty. Like the next one. 4. 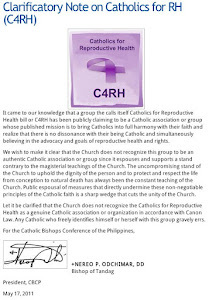 False: The Church is against the RH Bill; ergo the Church is against women’s health. The Pope first noted that the widespread use of contraception would “lead to conjugal infidelity and the general lowering of morality.” That there has been a widespread decline in morality, especially sexual morality, in the last 25 years, is very difficult to deny. The increase in the number of divorces, abortion, our-of-wedlock pregnancies, and venereal diseases should convince any skeptic that sexual morality is not the strong suit of our age. The Pope realized that the Church’s teaching on contraception is designed to protect the good of conjugal love. When spouses violate this good, they do not act in accord with their innate dignity and thus they endanger their own happiness. Treating their bodies as mechanical instruments to be manipulated for their own purposes, they risk treating each other as objects of pleasure. Paul VI also observed that the widespread acceptance of contraception would place a “dangerous weapon… in the hands of those public authorities who take no heed of moral exigencies.” The history of the family-planning programs in the Third World is a sobering testimony to this reality. Moreover, few people are willing to recognize the growing evidence that many parts of the world face not overpopulation, but underpopulation. It will take years to reverse the “anti-child” mentality now entrenched in many societies. Pope Paul’s final warning was that contraception would lead man to think that he had unlimited dominion over his own body. Sterilization is now the most widely used form of contraception in the U.S.; individuals are so convinced of their rights to control their own bodies that they do not hesitate to alter even their own physical make-up. 5. False: The RH Bill will uplift the lives of the poor. Truth: The only way to uplift the lives of the poor is through education. People may ask, why not do both – give contraceptives and educate? Because in a world where governments are asking their citizens to bear more children because of the effects of demographic winter, we cannot afford to follow their example. Truth: We have yet to see someone who became rich because he wore condoms. The poor who use the contraceptives given to them remain poor; the educated child, however, has a real fighting chance to uplift himself and his family from poverty. Plagiarism is not the same as abortion. The former is a grave sin and the latter is a mortal sin. Do not consider the former as mortal and the latter as grave because that is distortion and manipulation of truth. Mabuti pa ang Plagiarism protektado ng International Property Rights (RA 8293) pero ang Buhay pilit na sinasabing pinoprotektahan ng Reproductive Health Bill (HB 4244) kung saan may tahasang pagkitil sa buhay. Do not consider plagiarism as more important than abortion (brought by abortifacient contraceptives). What is grave is grave and what is mortal is mortal. 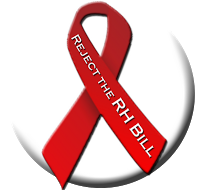 Sen. Sotto and his staff are responsible for what they have done; however, the proponents of the RH Bill should expose the lies contained in the Bill. Those lies constitute mortal sin for they are against the dignity of life and because of this reality the proponents are in constant act of sinning for those lies.